Stress-free relaxation, relief from sore tense muscles, better sleep, we all know the benefits of owning a hot tub, but the thought of investing in a hot tub of your own seems daunting. Traditional, acrylic hot tubs are expensive to purchase, expensive to run, and that doesn’t even take into consideration all that goes into installing a traditional hot tub. Fortunately, you don’t have to endure all of the added expense and headache of a traditional hot tub to get all of the benefits. Check out the Softub difference below. From step one, you will notice the difference between Softubs and traditional hot tubs. Acrylic hot tubs require a concrete pad, which usually involves at least some level of construction. Softubs on the other hand only require a level surface to set up. You can even put them in your basement or sunroom, as long as it’s level, you can instantly set up your Softub. Softubs also plug right into a traditional, designated 15 amp 110v outlet and come with a ground fault indicator, so you can plug your Softub in and get soaking. Traditional tubs require a 220v 60 amp line, which means an added expense to pay an electrician to come install a new outlet. With your ground prepped and your outlet designated, you are ready for your hot tub to be installed. This process also varies dramatically depending on which kind of tub you choose. Acrylic tubs require a scheduled set up which usually involves several men and depending on the site some installations can even require a crane! Not so with a Softub. 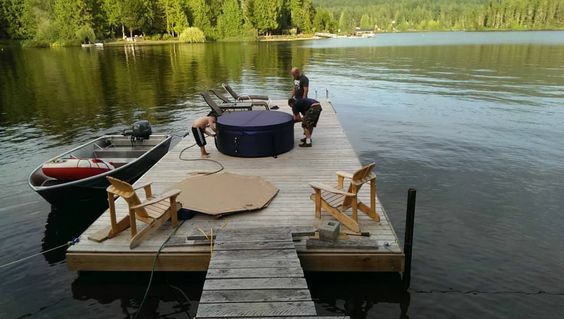 As soon as your tub is delivered, one person can set up the Softub alone in a matter of minutes, no crane required! The differences continue and keep getting better as you move into using your hot tub. So far, a Softub offers less expense and an installation process that is significantly faster. Softubs continue to save you money with every use when compared to traditional tubs. The separate heating element on a traditional hot tub means that the tub must be heated to a minimum of 104 degrees-the cost on average runs $30-$60 a month. Softubs do not have a separate heater-they can be continuously heated to your comfort level from 80-106 degrees. The average cost for heating your Softub only runs about $14 a month. Softubs also offer flexible seating. Traditional hot tubs with molded seats keep you locked into a certain number of guests and a rigid way of sitting. Softubs have barrier-free interiors that allow you to stretch out and relax any way that you want. One of the biggest benefits of a Softub is their portability. Traditional hot tubs require reinforced slabs, special outlets and can weigh 400-900 pounds; basically, wherever it is installed it has to stay. A Softub can be moved as often as you want. The heaviest component of a Softub is 80lbs, it can be rolled anywhere you want a hot tub: upstairs, downstairs, outside or down the block. With a Softub your hot tub comes to the party, not the other way around. If all of these impressive differences don’t have you convinced that a Softub is the best hot tub and you are still undecided, stop by our showroom and let our experienced staff show you all the reasons you will love a Softub.